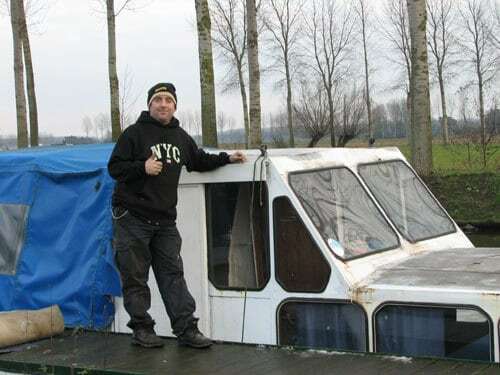 27th November 2010 – I went cleaning the yacht in Ghent and made her ready for the big trip tomorrow to Ghent. She is a small ship but the amount of work that needs to be done is huge! While cleaning, I managed to flip the fuse of the electricity several times. A hoover or a water cooker were to strong. I’ll be glad when I can leave this mooring. 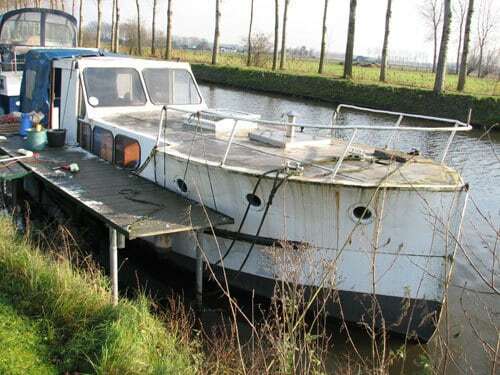 26th November 2010 – Since I have a small car I had to sort out what tools I might need tomorrow aboard the yacht. Last time, for the Frantsis we had a large car that was filled up to the roof. Now I only have a third of the space. 22nd November 2010 – Another wall in the back accommodation is finished. One more to go, the last one. 21st November 2010 – Finishing the walls with tongue and grove is a boring job. After a while you it becomes so repetitive. It looks good when it is finished and that is the most important thing! 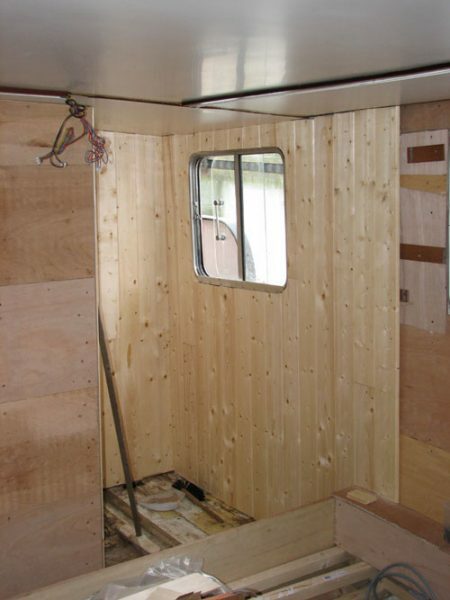 20th November 2010 – Since I build the shower myself, the wooden construction needs to be waterproof. My sheets of multiplex are waterproof, but actually that is only the glue they used to fabricate them. Therefore a seal has been glued over the sheets. It needs to dry a day, so I’ll see when I continue tiling the shower area. 17th November 2010 – The workbench in the engine room was extended so I could mount the water pump. There is also enough space for some tools like spanners and screw drivers. I still have to paint the new construction in case I ever have a leak. The wood will be protected. The plans for the little yacht are finished. I now have to draw them in scale, once this is done I’ll post the plans. 17th November 2010 – There had been no updates for some time. I sold the Frantsis and bought a yacht from the 20’s. I worked hard in the back accommodation of the Watergeus and had some personal issues. Updates will follow more quickly again! 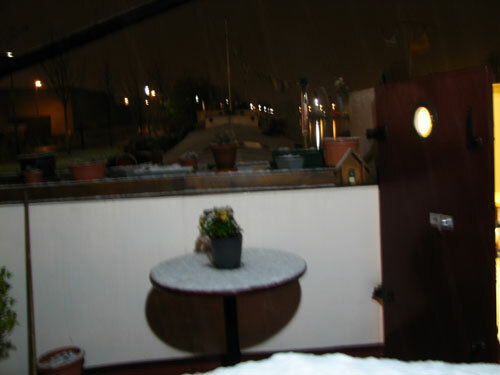 15th & 16th November 2010 – My neighbour is having some trouble with her diesel heater. On Monday I temporary mounted a small heater, but it was to small. So today I had to put back the other one. It is one of the most dirty jobs since fuel and ashes really get deep into your hands. It takes ages to clean them. 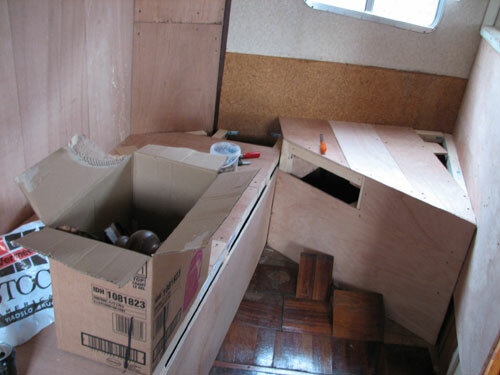 14th November 2010 – In the afternoon I continued working on the back accommodation, but discovered I had ran out of wood. So I cleaned the room and made everything ready for tiling the shower and bathroom. 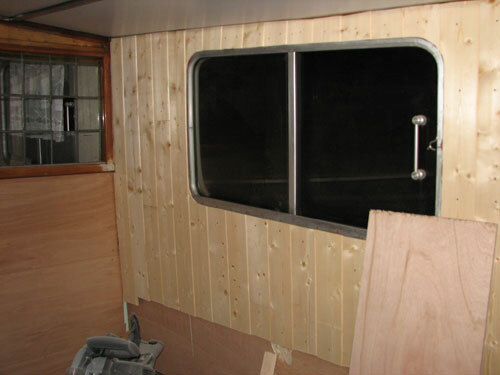 13th November 2010 – Some more woodwork was done in the back accommodation, mainly finishing one side with tongue and groove pine wood. It is a slow job, but I like the result. I removed the remaining electricity cables, include the whole 24v circuit. 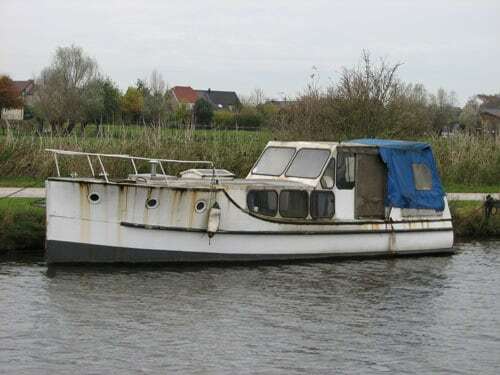 It is to expensive to maintain a 24v circuit when I have mains power and I never sail the Watergeus. 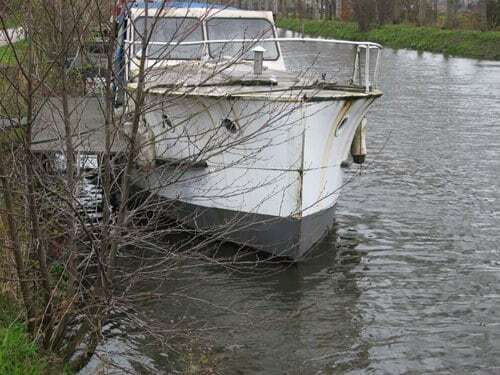 11th November 2010 – When you buy a boat it is important to pay several visits before making a decision. The last couple of weeks, I had been making drawings and plans nearly every evening. I had another visit today, did some small measures and made my decision. I’ll give it a try! 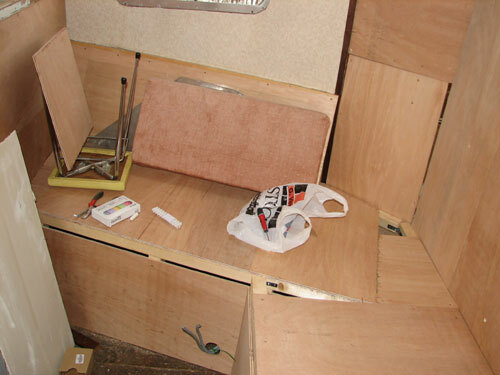 8th November 2010 – Where the sleeping room used to be in the back accommodation, I built a set of benches. I finished most of the area.